What would you do if you saw someone collapse and fall to the ground in front of you? Some might panic and do nothing. Some might at least call for help, and others might attempt some form of CPR. There’s good news for both the person who has collapsed and the bystander who needs to help out. The rules of CPR have changed, and they can’t be any simpler. In the recent past, we were advised to do mouth-to-mouth breathing as well as chest compressions. I think many were confused as to how often to do the breathing and how fast to do the chest compressions. I’ve known many people who rightfully were hesitant to do mouth-to-mouth on a stranger, and I think that very fact kept people from getting involved in the first place. It has been reported that only a third of those who suffer a cardiac arrest receive CPR from a bystander, and without CPR, there is virtually no chance of survival. New research confirms that, for bystanders without training, doing only chest compressions on adults is enough to restore life. It is now known that continuous, uninterrupted chest compressions will deliver sufficient oxygen to the heart and brain, eliminating the need for mouth-to-mouth breathing. Making CPR easier means more lives have the potential to be saved. A person who goes into cardiac arrest usually has gone into a heart rhythm called ventricular fibrillation. This means that the heart beats so fast and irregularly that the heart cannot pump blood, and therefore the body is completely deprived of oxygen. Without circulating oxygen, a person cannot survive more than seven or eight minutes. In these crucial minutes, if a heart is given an electrical shock by trained medical personnel, it has a chance of its rhythm being changed back to a regular one, restoring the oxygen flow to the body. First of all, when at all possible, call 9-1-1 to initiate an emergency medical response. 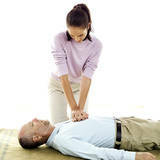 Then, immediately begin chest compressions. Position both hands on the center of the breastbone and press down, hard, about 100 times a minute. Do not stop until emergency medical crews arrive or you are too exhausted to continue. I recently read in the local paper about a 50-year-old bicyclist who collapsed from cardiac arrest. A bystander who saw him was willing to perform CPR, and the man survived and is doing well. I believe that he, his wife and his children are happy that someone was willing to perform CPR on him. Just think how meaningful it would be to save the life of a stranger — much less that of a loved one.